Members who have just joined Worldprofit should start the HOME BUSINESS Bootcamp Training. If you don't learn the basics by following the training you won't make money online. We teach you exactly what to do in our online training program and each week we compliment the online lessons with LIVE training. Previous recordings of George Kosch's bootcamp training is posted to http://www.worldprofit.ca and can be searched by topic or key word. If you are going through the Safelists in the 20+ Income Streams and run into a problem or login issue with any of them, just skip that one. Move on. The suggestions we provide are just a small sampling of Safelists, there are HUNDREDS of them, use your own favourites if you like or take the recommendations of other active Members who post their favourites to Worldprofit's Facebook group. Preliminary set up suggestions for new Members. Watch the two videos for Beginners. Start the Bootcamp Training. Start at Lesson 1 and do each task to proceed to the next lesson. Get a pad of paper, write down your passwords, important information. Get set up with your Gmail accounts as per the training. Organize yourself. We offer a Reminder system you can use (it's included in your Membership) Promotion. Don't limit yourself to our recommendations but if you use your own sources make sure they are legitimate. Discussion: Factors effecting conversion rates what you need to consider. Types of Promotion Quality of leads depends on the source and your budget. Paid advertising at reputable sources get better results than free ads. Advanced Daily Check List - Do your List Building - Do a brief video (or screen capture) of something you are doing to build your business. - Post your video to YouTube (use the Lazy Blogger that we provide) and tie this into your Facebook - Post your video to various groups (that allow you to post) and include some copy about free sign, video description etc. 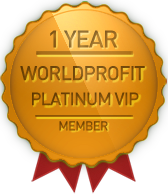 - If you don't have a Worldprofit hosted Video Blog consider getting one, it's just a one time set up fee. Video Marketing is a terrific way to generate leads and is more effective than article marketing. You can do both of course as any and all promotion is beneficial over time. Set goal for number of Associates to bring in. Commit to daily consistent promotion. If your budget permits, book paid ads. If your budget is limited just do the free promotions for now. Questioning the claims, the people who say they are making 10's of thousands of dollars a month... food for thought. Analyzing the numbers intelligently and filtering the hype. Treat your online business seriously, with respect as an actual business, NOT a business opportunity. The difference is the amount of work and time invested which of course then effects how much you earn. -How to use the Instant Sales Pages - optional (bypass the Live Business Center) -How Members can sell Super Solo Advertising Packages -Google Hangouts: How to set one up. We have a landing page in the Landing page builder that is specifically for Google Hangouts. Thank you to each of you who attended the LIVE training. The recording of the training is now posted to your Member area, on TOP MENU select TRAINING. Worldprofit's Next LIVE Home Business Bootcamp with George Kosch is Friday (every Friday) and is free for all Worldprofit Silver and Platinum VIP Members.